Florey's Book Co.: Florey's Book Club: 'In the Midst of Winter' Nov. 15th! Florey's Book Club: 'In the Midst of Winter' Nov. 15th! 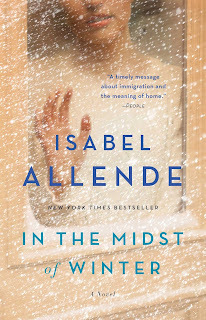 Come by for a chat about our November book, 'In the Midst of Winter' by Isabel Allende. In the Midst of Winter begins with a minor traffic accident--which becomes the catalyst for an unexpected and moving love story between two people who thought they were deep into the winter of their lives. Richard Bowmaster--a 60-year-old human rights scholar--hits the car of Evelyn Ortega--a young, undocumented immigrant from Guatemala--in the middle of a snowstorm in Brooklyn. What at first seems just a small inconvenience takes an unforeseen and far more serious turn when Evelyn turns up at the professor's house seeking help. At a loss, the professor asks his tenant Lucia Maraz--a 62-year-old lecturer from Chile--for her advice. These three very different people are brought together in a mesmerizing story that moves from present-day Brooklyn to Guatemala in the recent past to 1970s Chile and Brazil, sparking the beginning of a long overdue love story between Richard and Lucia. Exploring the timely issues of human rights and the plight of immigrants and refugees, the book recalls Allende's landmark novel The House of the Spirits in the way it embraces the cause of "humanity, and it does so with passion, humor, and wisdom that transcend politics" (Jonathan Yardley, The Washington Post). Born in Peru and raised in Chile, Isabel Allende is the author of a number of bestselling and critically acclaimed books, including The House of the Spirits, Of Love and Shadows, Eva Luna, The Stories of Eva Luna, Paula, and The Japanese Lover. Her books have been translated into more than thirty-five languages and have sold more than 65 million copies worldwide. She is the recipient of the Medal for Distinguished Contribution to American Letters, and she divides her time between California and Chile. December 2018 Events at Florey's Book Co.